Weekly through August 12, Summer History Camp—week of August 8 is full, but check to see if there’s space August 1-5. Visit the website for details. August 6-7, The Battle of Bushy Run—248th anniversary reenactment of the battle that pitted British troops against Native American forces; event also includes military camps, craftspeople, and other special programs. August 5-7, Kittanning Riverfront Park, Kittanning (Armstrong County)—hosted by John T. Crawford Camp #43, Sons of the Union Veterans of the Civil War and Auxiliary. August 12-14, Garnet Valley Middle School, Glen Mills (Delaware County)—hosted by Concord Township Historical Society and co-hosted by a slew of local historical organizations (visit website for full list). August 19-21, Penn Park, York—hosted by York County Heritage Trust. August 26-28, see listing for Somerset Historical Center below. 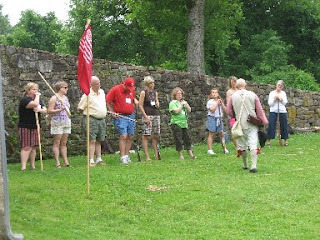 August 6, Guided Evening Tours—this living history program will introduce you to Conrad Weiser’s life and times, some of his friends, and the place he lived; a tour guide will accompany you to various spots on the site (program is 6-8:30 pm with the last tour at 8 pm). August 9, Monthly Lecture Series—“A History of Lebanon’s Water Supply,” with speaker Mike Trump (board member, educator, and recent co-recipient of Cornwall’s Volunteer of the Year award). Check the website closer to the date for details. August 10, Junior History Workshop—well-known living historian Clarissa Dillon will conduct a workshop on Hearth Cooking and Dairying for kids in grades 3-6; registration is limited, a copy of the brochure is here. August 14, Sunday Family Fun—“Building Stories” will teach you the components of telling the perfect story; storyteller Bill Stumpf will lead the way (Bill was recently featured on the blog “Milliver’s Travels"). 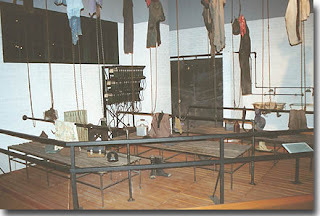 Reservations and program fee required, 814/827-2797. August 27, Saturday Family Fun—“Portraits in Plastic” lets you explore artists’ techniques from the 19th century as you create family or individual portraits. Reservations and program fee required, 814/827-2797. Oil Valley Blacksmiths will also be on hand for their monthly demonstration (that’s included in regular admission). 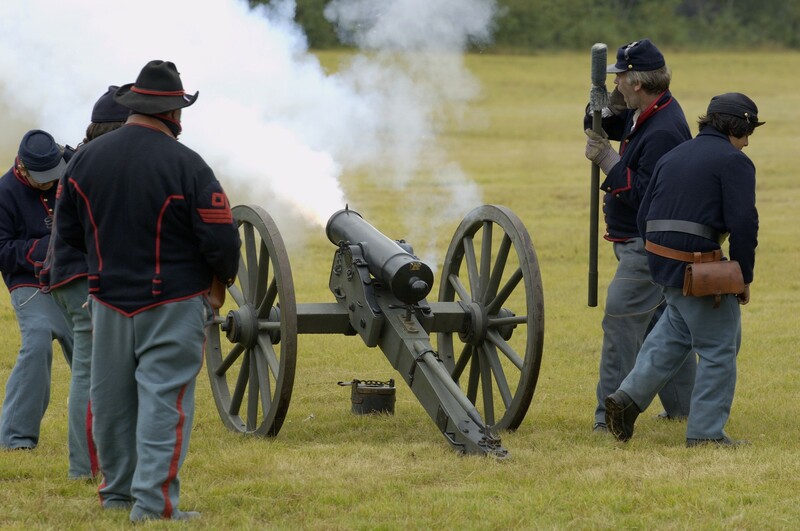 August 20-21, Living History/Civil War Weekend—experience patch town life in the 1860s with living history demonstrations, Civil War encampments, and other period events. August 20, Family Day—learn about families and their historic role at Ephrata Cloister, while taking part in hands-on activities that recreate 18th-century skills and interests (included with regular admission). August 13, Teachers Open House—contact educator Andrew Gaerte for details. August 1-5, Colonial Adventure Camp—it may be too late to register, but check here quick. August 21, Yellow Fever Program—this living history theater presentation explores the impact of the 1793 Yellow Fever epidemic on the residents of Graeme Park. August 10, Summer Movie on the Lawn—Whitemarsh Township Parks and Recreation presents National Treasure at dusk (rain date is Aug. 11). August 6, Community Day—the annual conference, designed for people who teach, practice, and are interested in historic building trades, will be held August 2-6 at Thaddeus Stevens College of Technology in Lancaster (more info here). On Saturday morning, August 6, activities and demonstrations for families and anyone else who wants to partake will be offered for folks not registered for the rest of the conference (details here). August 2, Hands-on History Day—children of all ages get to take part in hands-on activities from 18th- and 19th-century Pennsylvania German culture (also offered in Sept., Oct., and Nov.). August 13, Storytelling Day—storyteller Pennsylvania Jack will present “Tales of our Ancestors” and “Pennsylvania People and Places”; hands-on activities, other storytelling sessions, and visits to a one-room schoolhouse round out this day-long event. August 27, The Weathervane Art Show—Landis Valley’s museum store hosts a day of local artists and craftspeople demonstrating and selling their wares; live music and food will also be available. 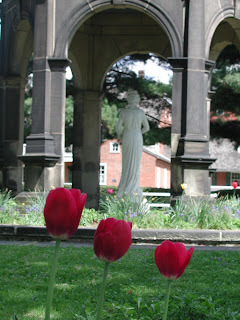 August 13, Garden Party—check website for more information. August 28, Gertrude Rapp’s 203rd Birthday Ice Cream Social—celebrate the birthday of the granddaughter of Harmony Society founder George Rapp and a force in her own right. August 7, Historic Trades—the joyner and blacksmith will be showing their skills with wood and metal. 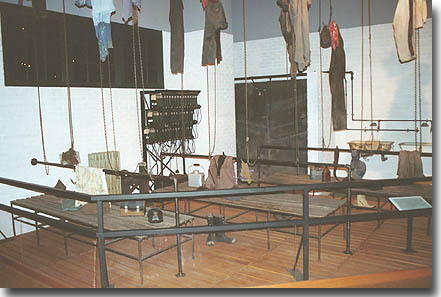 August 14, Living History Theater—“Penn Mead Trial” illustrates the 1670 trial of Quakers William Penn and William Meade for causing a riot in London; learn about how this trial shaped the American judicial system. August 21, Open Hearth Cooking Demonstration—“Summer in the 17th Century” shows you how the cooks worked with the summer’s harvest to prepare meals for the Penn family. August 28, Garden Highlights—spend some time in the kitchen garden, meet the gardeners, and help out with chores (if you like). August 6, Boot Camp for Kids—this new one-day summer camp experience is designed for boys and girls ages 8 to 13; instructors include prior service soldiers, sailors, airmen, and Marines. Registration and prepayment required, contact Joe Horvath. August 31, Friends of PMM Speaker Series—check the website for details. August 12-13, Hogwarts Express Parties—enjoy this program (recommended for ages 8 and up) inspired by the popular Harry Potter books (activities include reading from one of the books inside a historic railcar); limit 20 children per party (morning and afternoon parties each day), registration (by dropping off or mailing the form) is on a first-come, first-served basis. This week’s guest blogger is Rhonda Newton, managing director of the Pennsylvania Heritage Society and project coordinator for PHMC’s Teaching American History initiatives. PHMC has been involved with the Teaching American History program, a grant program funded by the US Department of Education, since its inception. 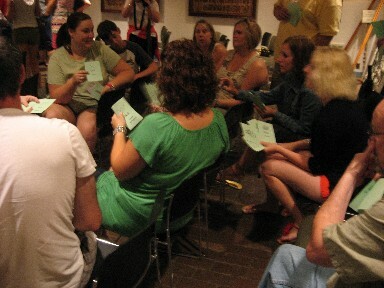 Since 2002, teachers from central Pennsylvania have spent a week at the State Museum and State Archives as part of three grant projects in partnership with Central Susquehanna Intermediate Unit (CSIU), which is based in Lewisburg. The participants in Keystones of the Federal Union, our current project, are K-6 teachers or librarians from the CSIU region as well as Dauphin, Cumberland and Perry counties. Last month, twenty-eight teachers spent three days in Harrisburg learning about colonial government, religion and politics in the American experience, and the French and Indian War. Then, we hit the road to learn about daily life in colonial America by visiting historic sites in Pennsylvania. On June 23, we started at Ephrata Cloister to learn about daily life in one religious community. Museum Program Coordinator Andrea Glass-Heffner and Museum Educator Michael Showalter led us through an exciting and interesting morning, starting with the “Little Sister” program in the Saal. The program introduced the Cloister by following one sister through her day, from getting dressed in appropriate clothing to sleeping with that wooden pillow. 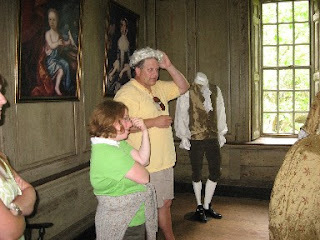 Next, we broke into groups to explore the print shop with Andrea and colonial medicine with Michael. Finally, our teachers debated what they would pack in their chests if immigrating to America. Michael created this activity by assigning point values to each of the different things an immigrant might bring from Europe like food, nails, cloth, a clock, and the like. Each chest is limited to 100 points so participants have to prioritize what they think is most important. He then surprised us by quoting from a letter written back to family in Europe with advice on what to bring – things that weren’t readily available in the colonies so could easily be sold for cash on arrival! We next journeyed on to Graeme Park to explore daily life in the country home of a colonial governor. Teachers toured the house, complete with trying on reproduction clothing, and learned about residents Sir William Keith and Elizabeth Graeme Fergusson. Breaking into smaller groups, they played colonial games, learned about firing a musket, and tried their hand at writing with a quill pen. It was a long and exciting day! Everyone was happy to get on the bus to head for our overnight stay in Bethlehem, where we toured the Colonial Industrial Quarter and Burnside Plantation on June 24. Thank you to all of the staff and volunteers who made our short journey on the Trails of History so interesting (and fun)! Back in February, we talked about PHMC’s 2011 theme, “William Penn’s Legacy: Religious and Spiritual Diversity” and promised to keep you updated as theme-related stuff rolled out. So, here we go. The theme website has launched and includes loads of resources for learning more about the complex roles of religion in Pennsylvania’s fascinating history. The Trails of History page, in particular, features information on and links to the PHMC sites that are most closely tied to this year’s theme. 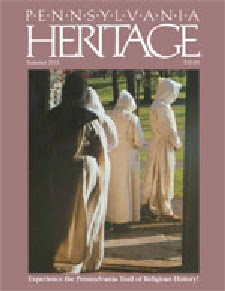 The Winter, Spring, and Summer 2011 issues of Pennsylvania Heritage magazine are filled with articles on various aspects of Penn’s religious legacy, including an article in the Summer issue by former PHMC staffer (and friend of Trailheads), John Robinson, focused on Trails of History sites. (In a tangential but not unrelated note, the summer issue also includes a new Trailheads feature that will appear quarterly until they tell me to stop.) Links to some of the theme-related articles, as well as other interesting reading, are here. A brief commercial break: You can purchase individual copies of Pennsylvania Heritage at PABookstore.com or receive a subscription as part of your Pennsylvania Heritage Society membership (we now return you to our regularly scheduled programming). Oh, and if anyone other than John Robinson played “Name That Zoom” a couple of weeks ago, PA Military Museum was, indeed, the answer. Two PHMC projects were among the 59 recipients of Leadership in History Awards from the American Association for State and Local History (AASLH), recently announced by the organization. “Soldiers to Governors: Pennsylvania’s Civil War Veterans Who Became State Leaders,” a publication written, designed, and published by PHMC staff, and “William Penn: Seed of a Nation,” the visitor orientation exhibit at Pennsbury Manor that was based on years of research by staff and consulting scholars, were recognized for achievement in the preservation and interpretation of state and local history. Congratulations to all the folks involved with these projects on this national recognition. Four other Leadership in History award recipients are from Pennsylvania: Jefferson County History Center, Brookville; Wharton Esherick Museum, Paoli; Fairmount Park Art Association, Philadelphia; and the City of Philadelphia Department of Records. Here’s wishing you and yours a happy, healthy and safe Independence Day weekend—may it include a stop at the historic site of your choice. Many, but not all, sites on the Trails of History will be open on July 4th from 9 am to 5 pm. Please check ahead to make sure the site you want to visit is open for business. If the hot dogs, watermelon, and fireworks keep you too occupied, there are plenty of opportunities to visit the rest of the month. July 12-15, Pieces of the Past: Our Heritage Valley—annual summer camp for kids ages 7-12; registration form is here, and the deadline is TODAY (July 1). Weekly through August 12, Summer History Camp—weeks of July 25 and August 8 are already full, but spaces may remain for the other weeks. Visit the website for details. July 10, Bushy Run Trail Run 5K Race & Walk—this race/walk (you choose) passes through the scenic trails of Bushy Run Battlefield; contact Penn-Trafford Area Recreation Commission for details or to register. July 3, Ringgold Band Concert—this annual event honors all military veterans. Concert is at 1:30, veterans who stop by the registration table between 1 and 1:30 will receive an American flag, compliments of the Friends of Conrad Weiser Homestead. Womelsdorf Fire Company will be on hand with food sales starting at noon. July 4, Independence Day Program—military and civilian reenactors, guided tours of the Boone House, craft demonstrations, camp cooking and more; bring a picnic and enjoy the lovely grounds. July 19-21, History Day Camp—visit the website for more information. July 27, Junior History Workshop—check here for more info (also offered August 10). July 10, Sunday Family Fun, Recycled Rockets—come for a program on water rockets; limit 20, please call 814/827-2797 to reserve your spot. July 30, Saturday Family Fun, Old Time Tastes—try old-fashioned recipes to make and share lemonade, bake bread and cookies, and churn butter. Yum! Limit 20, call 814/827-2797 for reservations. July 30, Oil Valley Blacksmiths will be on hand for their monthly demonstration day (included in museum admission). 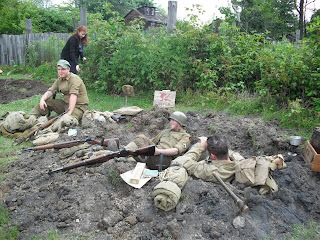 July 16-17, Armed Forces Tribute Weekend—this program honors those who have served their country from the Civil War to the present day; reenactors, food, and special activities will be on hand both days. Children will have the opportunity to color drawings to be included in care packages for men and women currently serving overseas. July 16, Celtic Festival—15th annual celebration of the Scottish heritage of the Keith, Graeme, and Fergusson families connected to Graeme Park; vendors, entertainment, and food are part of the fun. July 24, Shakespeare in the Park—Theatre Horizon of Norristown stages As You Like It on the grounds. August 1-5, Colonial Adventure Camp—kids who will be entering 4th through 7th grade this fall can still sign up for camp, but time is running out. July 27-29, Summer History Camp—students who have completed 1st through 5th grade participate in hands-on activities to learn about the life and times of Dr. Priestley and his family. Contact Cindy Inkrote, Northumberland County Historical Society, for details and registration, director@intunewireless.net. July 9, Civil War Day 1863—come see how life in a rural Pennsylvania village is affected by the presence of Union troops encamped in the area; reenactors will bring the crossroads back to 1863 for this program. July 16, Civil War Day—encampments, programs about soldiers’ daily lives, medical demonstrations, food, and activities for children will enliven the site. You can find more info here. July 3, Historic Trades—meet the blacksmith and the joyner as they demonstrate their metalworking and woodworking skills. July 10, Living History Theater—play tavern games and catch up on current events with the locals (I understand there’s news to be had about pirates). July 11-15 and July 25-29, Colonial Camp—designed for students who have completed 1st through 6th grade, the program includes lots of hands-on activities that teach about life in the 17th century. Check here for details. July 17, Open Hearth Cooking—the cooks are already thinking about preserving the summer’s bounty to last through the winter, and they’ll show you how they do it. July 24, Garden Highlights—the fragrances and colors of the summer garden will delight your senses. July 31, Animals at Pennsbury—meet the horse, oxen and sheep who call Pennsbury home. July 2-3, Bark Peelers’ Convention—37th annual presentation of this popular event that showcases the historic and modern skills of woodhicks and lumber camp workers; crafts, food, contests, and bingo are just part of the festivities. July 5, “Hoofbeats and Cold Steel, A Night with the Cavalry”—the Central PA Civil War Roundtable presents 2nd US Cavalry reenactor Charlie Doutt as he recounts the life and times of a Union cavalryman. July 14-17, People’s Choice Festival of Pennsylvania Arts—annual event showcasing arts and crafts of central PA; food and entertainment are also available; fee for parking on Museum grounds. July 23-24, VIETNAM Revisited—living history program portraying American support and combat troops during the late 1960s; go here for more info and photos of previous years’ events. July 27, “Deserter Country: Civil War Opposition in Pennsylvania”—speaker is Dr. Robert Sandow, Assoc. Prof. of History at Lock Haven University; his presentation is part of the Friends of PMM monthly Speaker Series. Through July 4, Reading Railroad Days (began June 29)—special tours, model railroad displays and other activities highlight one of the most important historical transportation systems in eastern Pennsylvania. July 11-15 and July 25-29, Barons & Builders Day Camp—all spaces are filled for this summer’s camp, but you can find out more info here and plan ahead for next year. July 6, 13, 20, and 27, Fossil Day Camp—this new program will be repeated on Wednesday mornings in July; the program is designed for children ages 9 to 11 and explores the Museum’s new paleontology exhibits and the adjacent Dino Lab. More info is here, including details on registration. July 4, Independence Day Celebration—the program features crafts demonstrations, tours of historic buildings, an encampment, and a reading of the Declaration of Independence.